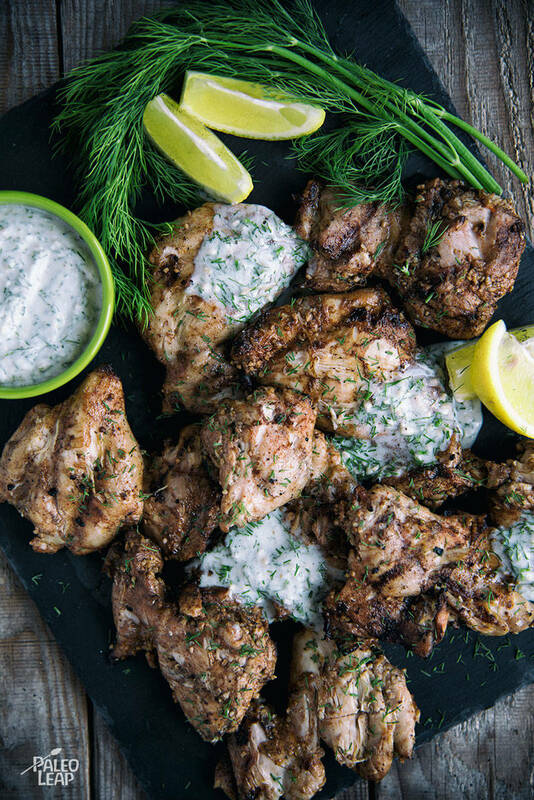 Fresh herbs and citrus with plenty of olive oil give this chicken a Mediterranean flavor, and a creamy dill sauce tops off all that crispy grilled flavor with a tasty contrast. You can make the sauce with heavy cream to take advantage of all the good fats in grass-fed dairy, or substitute coconut milk if you don’t tolerate dairy at all. To save a little time while cooking, you could also make the sauce ahead of time and just refrigerate it until it’s ready to serve – then you’d also get the contrast of a chilled sauce on the hot chicken. For a cold side dish, cucumber salad might be a good choice. Or if you’re in the mood for something hot, what about grilled kebabs with vegetables and lemon slices? And don’t forget a big glass of homemade lemonade on the side. In a bowl, combine together the minced garlic, nutmeg, allspice, 5 tbsp. olive oil, lime juice, and season with salt and pepper to taste. Brush the chicken, with the garlic-olive oil mixture. Place the chicken thighs on the grill, and cook for 5 to 6 minutes per side. While the chicken is cooking, mix all the ingredients for the coconut sauce together and season to taste. Drizzle fresh chives on top of the chicken and serve with the dill sauce.